Discover beautiful Birds of Prey in the glorious British countryside at Cass Sculpture Park this summer. With a focus on indigenous species, we will be sketching breeds including the Peregrine Falcon, Barn and Tawny Owls, in addition to Harris Hawks and others from around the globe. We will be introduced to these fine feathers with a detailed talk from an expert local falconer and learn about their anatomy, unique characteristics and how they’ve evolved to become powerful aerial hunters. You'll learn where to spot these birds in the wild and we will discuss the current conservation issues affecting these species. 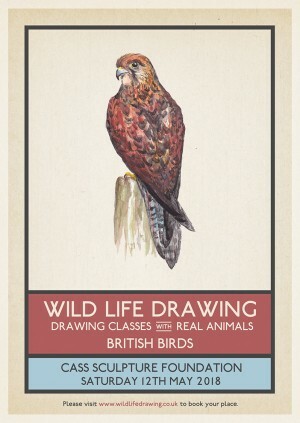 All the birds are truly charismatic with their own individual personalities and we guarantee you'll go away with not only some great drawings, but a new found respect and admiration for these beautiful birds of prey. All drawing materials are supplied, including paper and drawing boards, but please feel free to bring colours or any other specific media you might like to use. We'll start with some fun drawing exercises and plenty of practical tips to get everyone started, and creative guidance will be provided throughout the session. The aim of these drawing classes is to inspire a sense of appreciation and understanding for the animals and their conservation in the wider world. Wild Life Drawing is working with the finest animal handlers, sanctuaries and organisations to put on these events. All the animals that attend the sessions are well used to humans and different environments and are always accompanied by experienced handlers, their welfare is our highest priority. The falconer that keeps these birds is a trusted and experienced animal handler that works with the RSPCA to rescue, rehabilitate and re-release wild birds of prey around the South of England. *Species attending the session are subject to change as only happy and healthy owls are brought along.